NHS IN CRISIS – FIX IT NOW! Download and submit the Model Motion for support here. 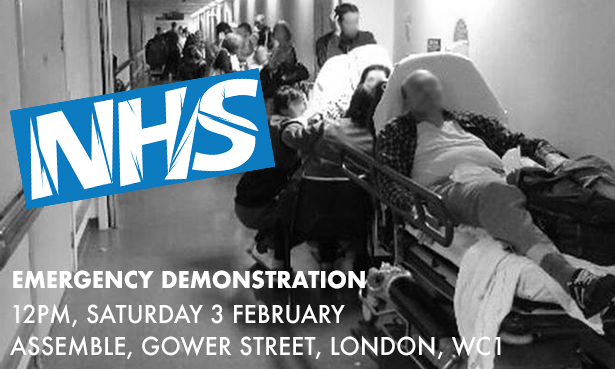 The People’s Assembly and Health Campaigns Together have teamed up again to respond to the worst NHS crisis in history. We’re calling on everyone; all campaigns and local groups, all round the country – to come down to London and demand proper funding, beds and full staffing levels on fair pay. Only two more days till we take our protest and party to the streets of central London. Major artists will perform along side leading campaigners and politicians. The next two weekends will see three important events. Please do all you can to get to them and spread the word. The government tells us there’s no money for our welfare state, education and public services but billions can always be found for war. 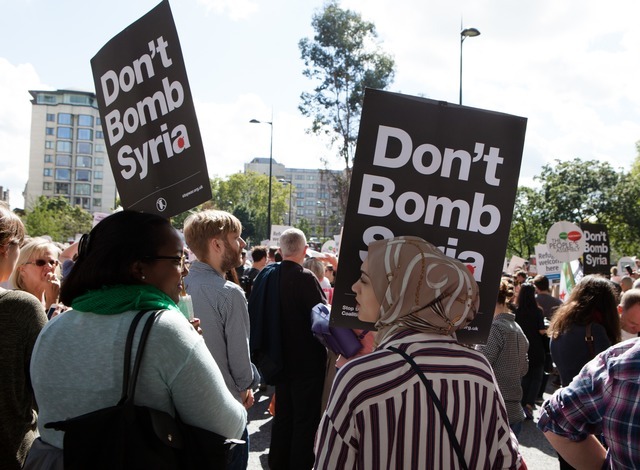 The proposed vote in Parliament on bombing Syria by British forces is likely to take place within the next week. A vote to bomb is more likely following the terrible events in Paris. Yet this bombing will not stop terror attacks. The People’s Assembly is opposed to military response and is supporting the Stop the War Coalition day of action. Protests will take place this Saturday around the country. I worked with Jack for around six years, designing and building El Museo del Barrio in East Harlem, of which he was the director. A good friend with a big heart and a wonderful poet. Jack’s smile sums it all up. Israel’s invasion of Gaza is not the act of a government looking for peace, compromise or any agreement. This is the act of a government committed to pitiless war against a whole people. This is why we need to use the last 24 hours to spread the word even further about tomorrow’s Gaza demonstration. This Thursday, on 10 July, up to 2 million people will be out on strike in a co-ordinated strike action across the trade unions. There will be huge demonstrations and protests up and down the country. Course: Youth- Demand the Impossible 2014! Sun Ra’s Solar Archestra Live in London! I don’t often do this, advertise a gig but Sun Ra’s Solar Archestra has to have an exception made for it. I went to one gig at Cafe Oto a couple of years back and although Sun Ra relocated to the celestial sphere some while ago, the Archestra, under the direction of Marshall Allen, who as been with the Archestra since the very beginning, is, as they say, kickin’ arse! So, if you live in or around London this month, why not check it out. Event: People’s Europe versus Corporate Europe: What should the Left be demanding of Europe? From the proposed TTIP trade deal, to fracking and the privatisation of our NHS, the EU too often operates in the corporate interest. Across Europe we are faced with the choice of neoliberal technocrats or far-right nationalists.